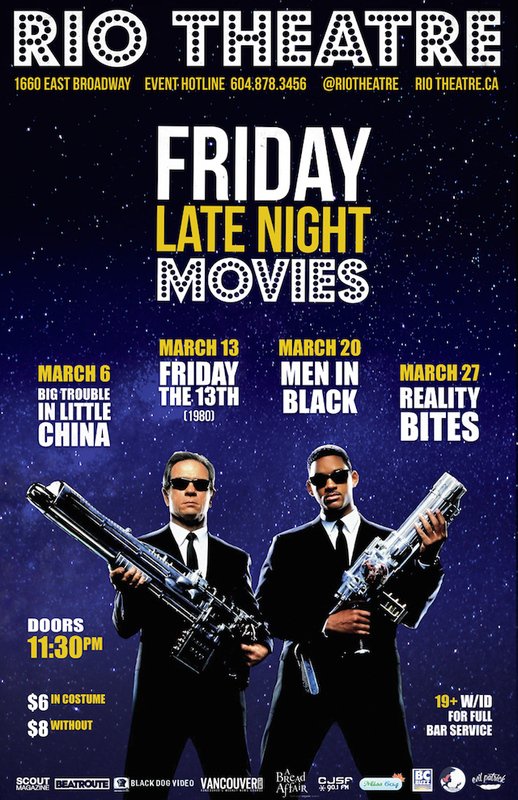 The Rio Theatre is cranking out hits from the 80s, 90s, and 2000s for March’s Friday Late Night series. Tickets are available online in advance or at the door for $8 or $6 if you come in costume for the midnight shows. These 19+ screenings can be complimented with a beverage from the theatre’s full service bar as you enjoy a night out with friends. The original Friday the 13th. On the big screen. On Friday, March 13. That’s so meta! (Or something.) Also, Kevin Bacon. Camp counselors are stalked and murdered by an unknown assailant while trying to reopen a summer camp that was the site of a child’s drowning. Also starring Betsy Palmer. Director Barry Sonnenfeld’s sci-fi comedy based on the hugely popular comic book was one of the biggest blockbusters of the 1990s, thanks in no small part to the unusual (yet totally perfect) pairing of Tommy Lee Jones and Will Smith. Also starring Linda Fiorentino, Vincent D’Onofrio, Rip Torn, and Tony Shalhoub. A streetwise NYPD detective joins a secret organization that polices extraterrestrial affairs on Earth. Director Ben Stiller’s Reality Bites has taken on a life of its own since its release in 1994, becoming a beloved cult-classic touchstone for anyone who came of age (or didn’t) during the 1990s. Starring Ethan Hawke, Winona Ryder, Janeane Garofalo, Ben Stiller, and Steve Zahn. Generation X Graduates face life after college with a filmmaker looking for work and love in Houston.